18-49 target: Intact’s channels consolidated their market share numbers during Prime Time (+8%), Whole Day (+2%) and Late Fringe (+11%). Urban All: the TV division led during Whole Day, Day Time, Access and Late Fringe during the first five months of the year, while the Prime Time interval grew by 5% compared to the same period last year. National: Intact Media Group’s TV stations held the first position during Day Time and Access, while Prime Time interval surged by 7%, compared to January-May period last year. Antena 1, the flagship entertainment channel, home to the largest star system in Romania, consolidated its Prime Time market share numbers on the commercial target. The first five months of the year showed market share numbers evolving by 7% during Prime Time and 17% during Late Fringe, while audience numbers rose by 11% during Late Fringe on the 18-49 target, compared to the same period of last year. Chefi la cuțite (Game of Chefs), iUmor (comedy show), Insula Iubirii (Temptation Island), Te cunosc de undeva (Your face sounds familiar) were the most watched productions in May. 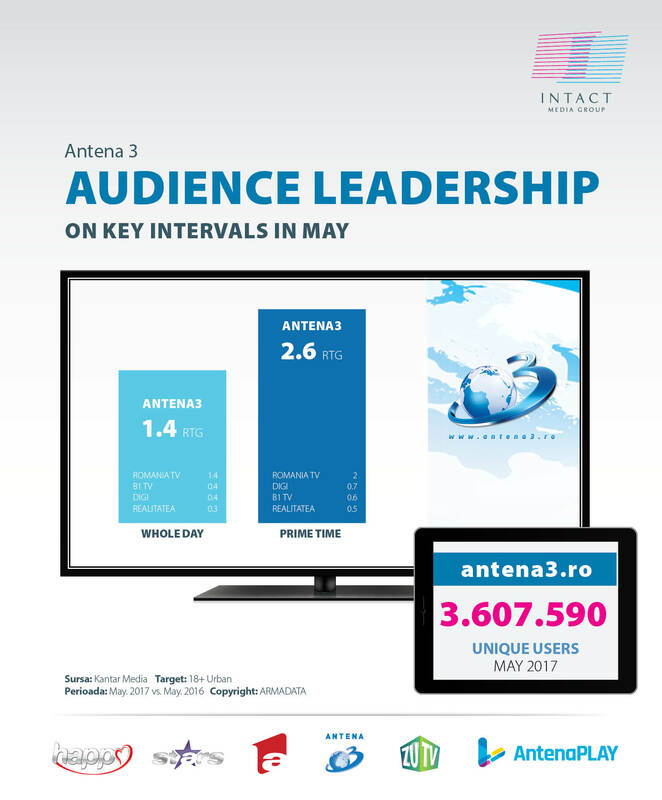 Antena 1 was watched in May, during Whole Day, for at least one minute, by 6.895.000 Romanians, whilst www.A1.ro had more than 4.5 million unique users. Antena Stars, the only TV channel dedicated to showbiz, had significant market share growth during May, including during Whole Day (+24%) and Prime Time (21%), on the urban commercial public. The market share evolution also includes Day Time (+11%), Access (+14%) and Late Fringe (+69%). The audience numbers rose by 33% during the Late Fringe interval, as compared to May 2016. Over 2.7 million Romanians watched Antena Stars in May, on the national target, during Whole Day, for at least one minute. The most popular productions were “Star Magazin special”, “Vedetop”, “Agenția VIP” and “Răi da’ buni”. Happy Channel, the Group’s TV station addressed to daring women, had market share (+27%) and audience (+20%) appreciation during Prime Time compared to the first five months of 2016 (Target 18-49 Women, Urban population). The most popular series of the station included “Elif”, “ “Sezonul cireșelor” (Season of cherry), “Happy Day”, “De trei ori Ana” (Tres veces Ana). Day Time, while the market share rose by 6% during Whole Day, 22% during Day Time, 14% during Access and 15% during Morning. The January –May interval sees audience and market share appreciation on all time intervals, compared to the same period of last year. Audience numbers grow by 6% during Prime Time and 12% during Whole Day, while market share evolves by 14% during Prime Time and 20% during Whole Day. On the 18+ target, specific to the news niche, Antena 3 was watched in May by more than 3.4 Romanians every day, on the National level. “Sinteza Zilei”, “Adevăruri ascunse”, “Subiectiv”, “Voi cu Voicu”, ”În premieră” were the most watched productions in May. On the digital front, Antena3.ro had more than 3.6 million unique users in May. On the online front, Digital Antena Group was the only publisher in Romania with two of its sites in top 10 all sites in .ro: a1.ro (7th place) and spynews.ro (9th place). Over 8 million Romanians watched Intact’s programs in may during Whole Day, for at least one minute, on national level, while 6.1 million were reached during Prime Time.